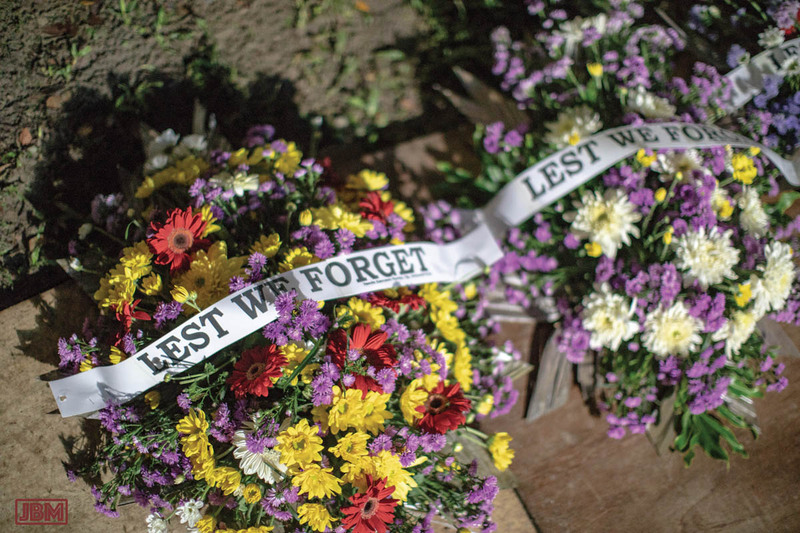 This morning we attended the Anzac Day dawn service at Pasir Ridge here in Balikpapan. And it was every bit as interesting as we had expected it to be. 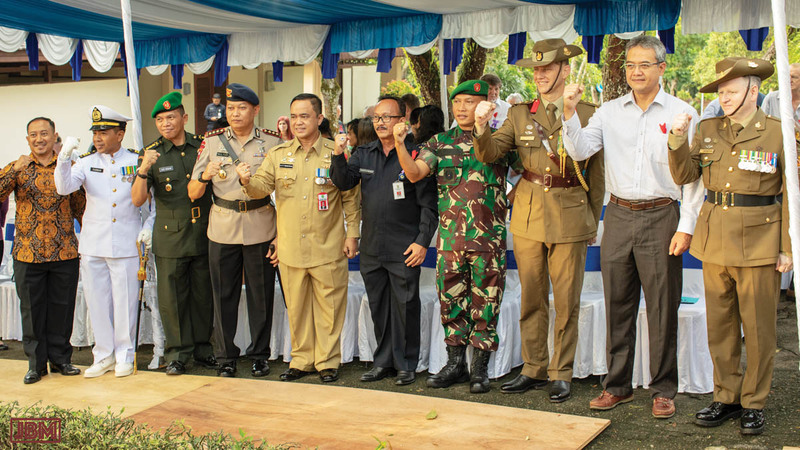 The event did however involve some measure of culture shock, as we listened to the unaccustomed tones of Australian voices in Balikpapan, and (a recording of) a Scottish pipe band playing ‘Waltzing Matilda‘ and ‘Along the road to Gundagai’… repeatedly. 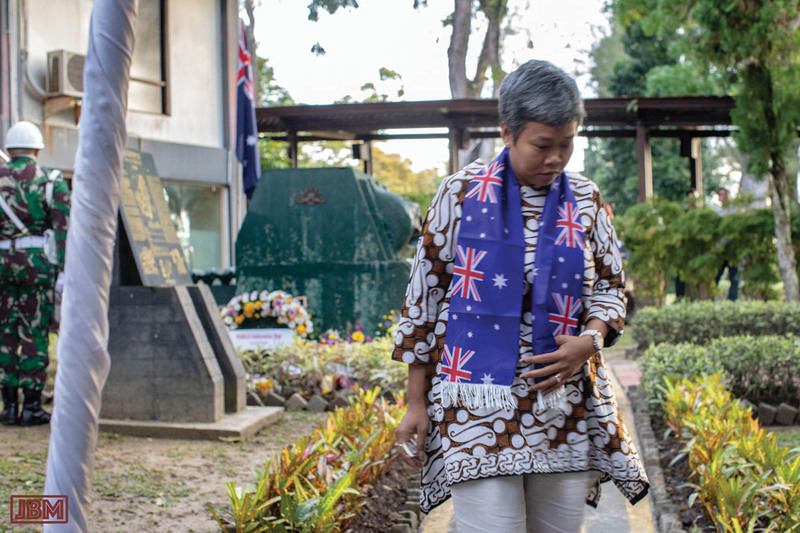 The Anzac Day dawn service is a well-established annual event here, one of only four locations in Indonesia where the day is officially commemorated. 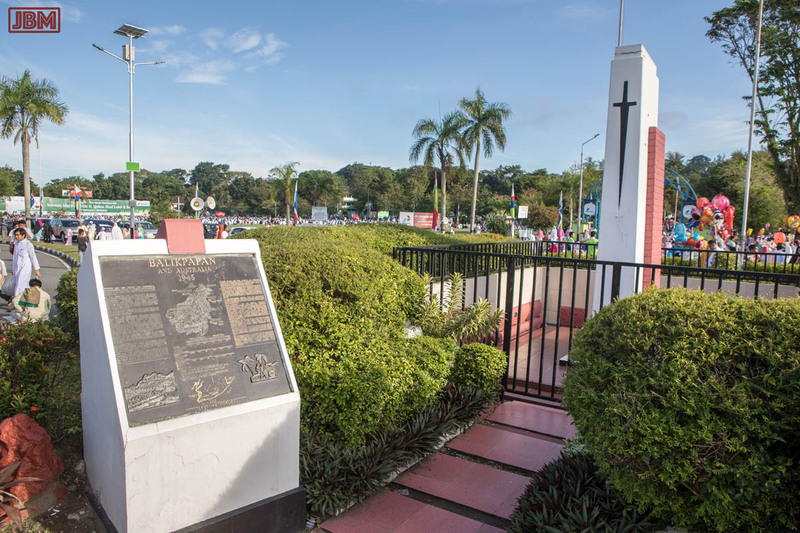 Balikpapan is also home to a well-maintained Australian War Memorial (the Tugu Australia) which sits in the middle of a roundabout down on Jalan Jenderal Sudirman. Balikpapan was the site, on 1 July 1945, of the last major land operation of the Second World War, and the Australian Army’s largest ever amphibious landing. 21,000 Australian troops, supported by artillery and Dutch, British and American air and naval forces, overwhelmed the Japanese occupying force of just 3,900 soldiers. By that time, the Japanese had occupied the island of Borneo for three years. However many historians, and even many military leaders at the time, have said that the operation served no worthwhile strategic purpose. The oil refineries, port facilities and most of the military fortifications had already been destroyed by months of artillery and aerial bombardment (comprising some 23,000 shells). The Japanese forces in Indonesia were already close to collapse, and (as it happened) the end of the war was only six weeks away. 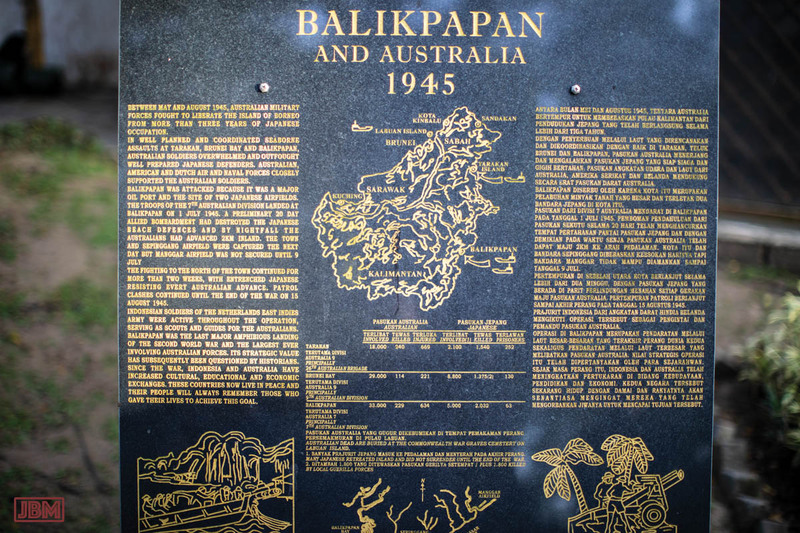 Nonetheless, 229 Australians died in the ‘Battle of Balikpapan’, and 634 were wounded. 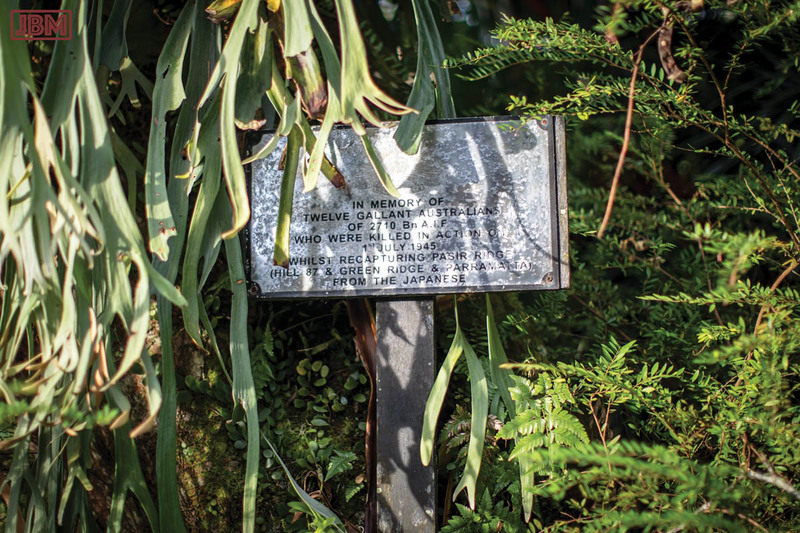 Pasir Ridge, where today’s service was held, was the site of some of the fiercest fighting. Around 1800 Japanese soldiers were also killed in the battle (nearly half of their total number), and just 63 were taken prisoner. 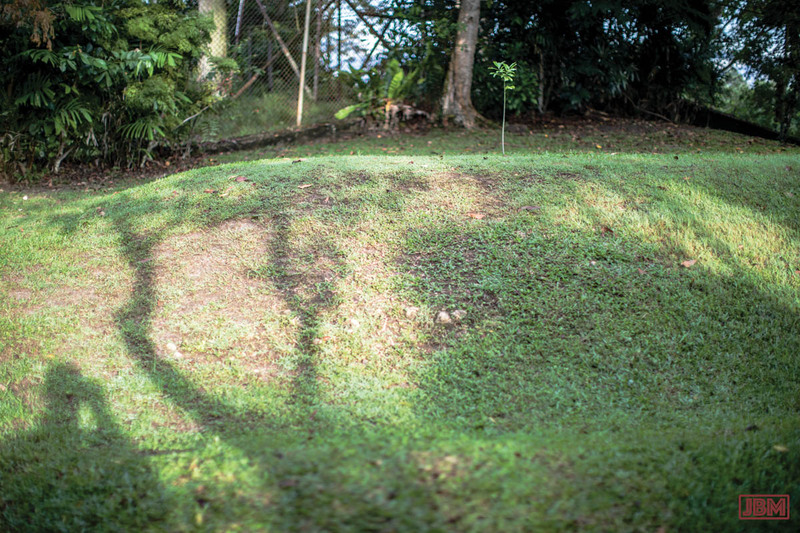 Near the site of the Australian memorials on Pasir Ridge is an unmarked and unremarkable mound of earth, where a number of Japanese casualties were buried in a mass grave. Despite the early hour, we were keen to attend the commemoration. In part this was because my father was here on that day, almost 73 years ago. He was on board the landing ship HMAS Kanimbla – though happily he was was not sent ashore, and his ship returned to Moratai the next day. 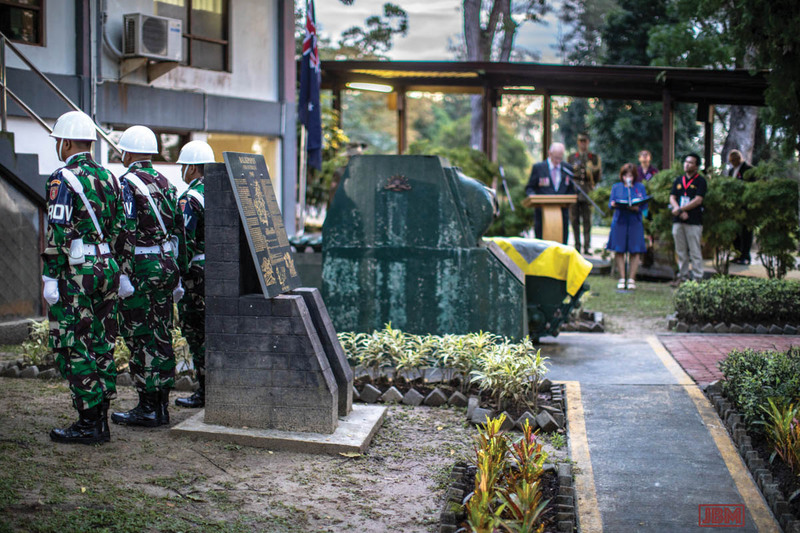 All up, around 100 people attended the dawn service at Pasir Ridge, which is on land now held by the oil company Chevron Indonesia. 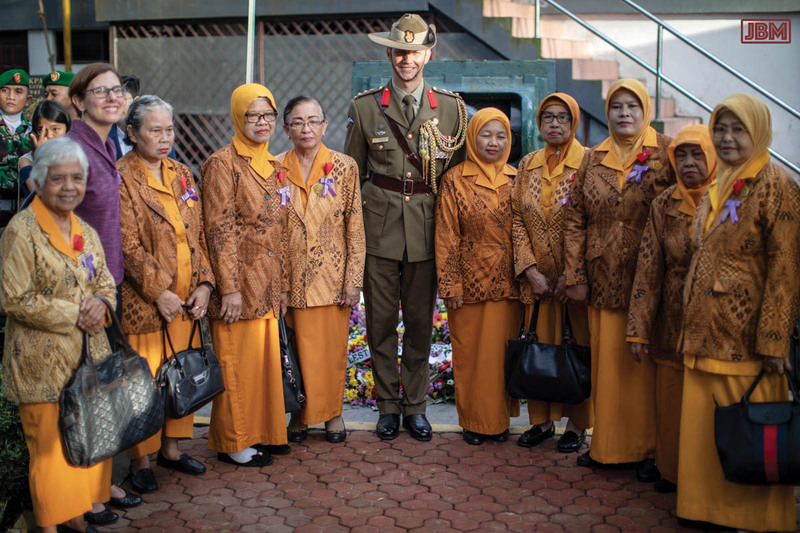 There were, amongst others: representatives of provincial and city governments, Chevron, senior staff (including military personnel) from the Australian Embassy, officers and rank-and-file from the Indonesian military (TNI), veterans and war widows, as well as a number of Australian expats resident in Indonesia. 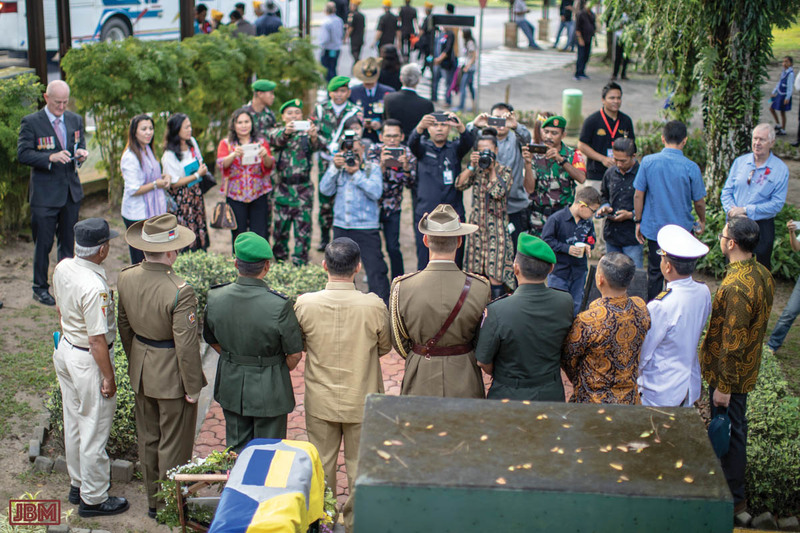 It was a nicely inter-cultural, Indonesian-Australian event, with all speeches and prayers delivered in both Bahasa Indonesia and (Australian) English language. Adjacent flagpoles flew the Indonesian flag (the ‘Merah putih’) and the Australian flag – at half mast. In front of the flagpoles, an Indonesian honour guard stood at attention throughout the service. 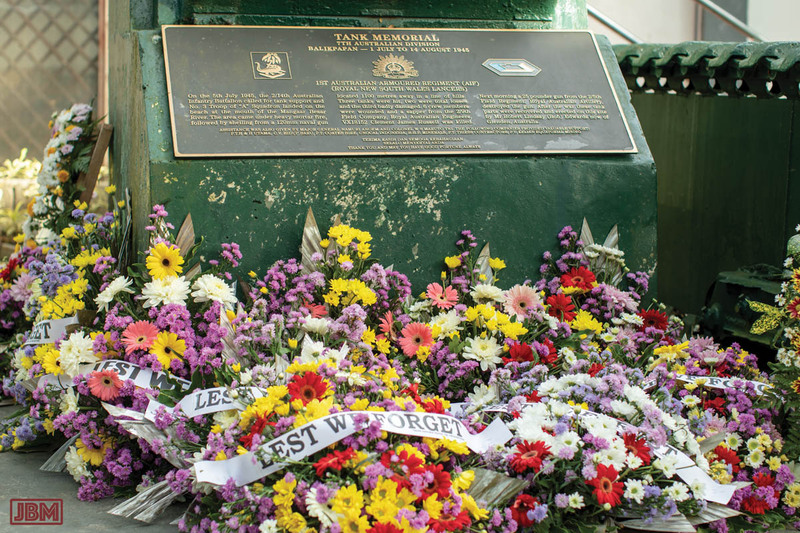 About a dozen large wreaths, each marked with the words “Lest we forget” were laid, by both Indonesian and Australians, on a memorial formed from parts of a wrecked Australian tank. As is traditional, the service concluded with (a recording of) The Last Post, a minute of silence, and Reveille. The Australian flag was raised from the half mast position up to the level of the adjacent Indonesian flag. And then (of course!) 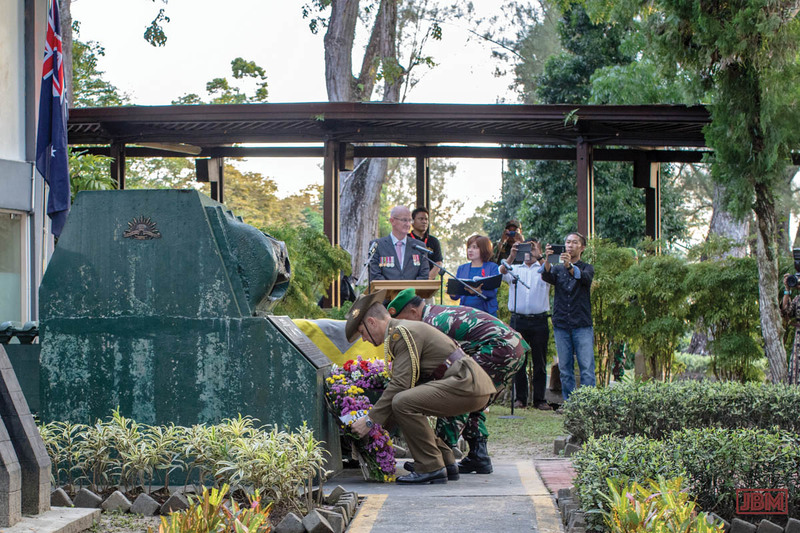 there was an extended block of time set aside for group photographs, with almost every possible permutation of people assembled and photographed in front of the tank memorial. Yes, including us! 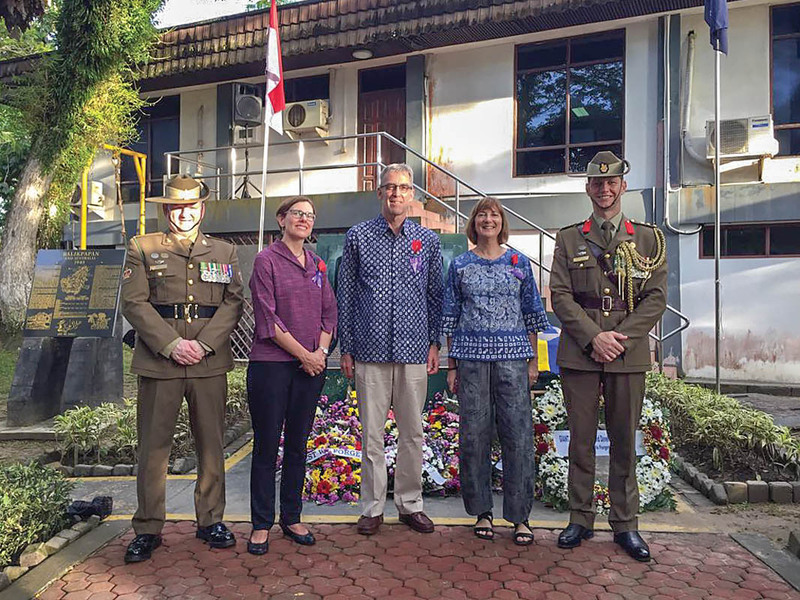 (Seen here with Fleur Davies, Matthew Campbell and Richard Swaby from the Australian Embassy in Jakarta). Thanks to the Organising Committee for our invitation to attend, and for planning and hosting such a memorable and professionally-run event. Lest we forget. This entry was posted in General, Indonesia and tagged Anzac Day, Balikpapan, Battle of Balikpapan, Pasir Ridge, Second World War. Bookmark the permalink. Great write up of the Anzac Day event. We all have great pride in being able to support this event and it is truly a community event that makes this happens, with donations and support from individuals and businesses. Many thanks for coming and hope to see you again next year. Thanks, Stuart. It was indeed a moving, interesting and enjoyable event. 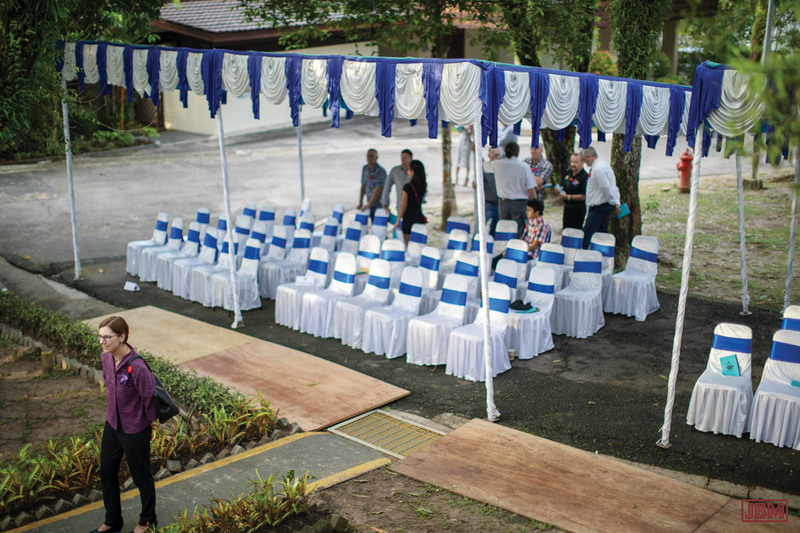 My father would have been pleased (and probably amused) that his son followed him to Balikpapan – 73 years later! Thanks to all who organised everything so professionally, and made the occasion so successful.